A wet race track adds a bit more suspense to the mix. Like the Skylines that preceded it, the Nissan GT-R was so far ahead of the competition that it seems to be in no danger of becoming irrelevant anytime soon. It’s even a bit hard to believe that the car itself is already a decade old given that it can still wow enthusiasts and surprise thieves who take them on joy rides. 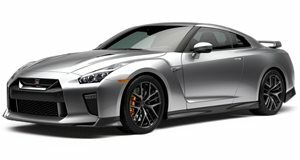 Even though Nissan is known for letting its products go stale, there wasn’t any way the automaker was going to let the GT-R stay on the shelf for too long. A few tweaks were made for the 2017 MY before a completely new model debuts. While visual changes make a subtle but noticeable difference, it’s the stiffer body shell, new suspension, and a faster shifting double-clutch gearbox that make a difference on the track, especially in the Nismo trim. To see just how much of a difference the complete package makes, Auto Express got the GT-R on track and put it through its paces. Unfortunately for Steve Sutcliffe, the Nismo happens to be on track tires. That's all good and well on a dry race track, but a cold, rainy UK day at Silverstone Raceway means that fast laps and a car review turn into a fight for survival. At least there's four-wheel drive and one of the most sophisticated traction management computers to help keep Sutcliffe alive.